This post brought to you by The Orkin Ecologist. All opinions are 100% mine. 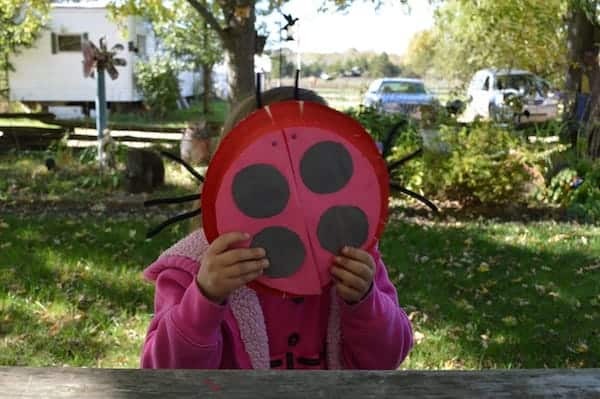 My toddler will be the first person in the house to run screaming from a “buzzing bee” or ask daddy to get rid of a”crawly spider.” To say she isn’t a fan of insects may be an understatement. So when it came time to create a science project involving insects, our options at first seemed pretty limited. She was NOT interested in collecting dead bugs to fossilize them with honey like mommy wanted. Nor did she want to look at pictures or create habitats for crawling insects. I had a problem on my hands, because while it’s totally okay to NOT like bugs, I didn’t want her wishing them all dead either. It’s important for kids to respect the natural environment around them, something Orkin is striving to make happen every day. 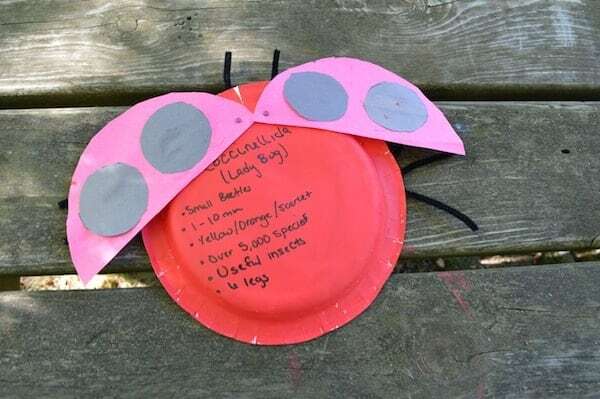 Whether they’re bug lovers or not, it’s important that kids learn to respect nature — including bugs of all kinds — starting at an early age. When they discover the beauty of a butterfly, or the role ants play in the world or even how termites help people, kids can learn to appreciate bugs — and not fear them. We spent some time exploring The Orkin Ecologist website and discovered some really cool facts about insects like Bee’s, Crickets and Butterflies. The latter of which finally piqued my daughters interest. She had been to visit our local Butterfly Garden and admired the delicate nature and beauty of butterflies. Unfortunately, they’re few and far between during fall in Michigan. Fortunately, we rediscovered an insect nearly as cute, Coccinellidae. But perhaps you know them by the more common name, Lady Bug. 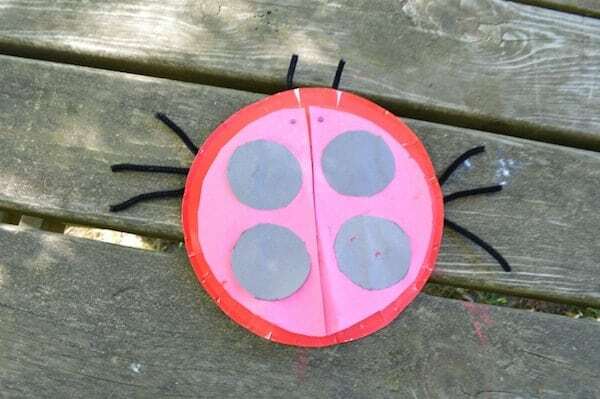 While we created this super fun DIY Ladybug Craft Project we took the time to talk about the way insects, bugs, and beetles (ladybugs aren’t insect, they’re beetles) make our environment better. 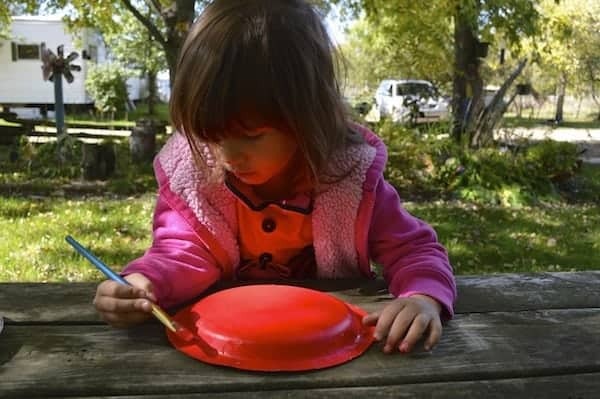 Begin by painting the back of one of the paper plates red. 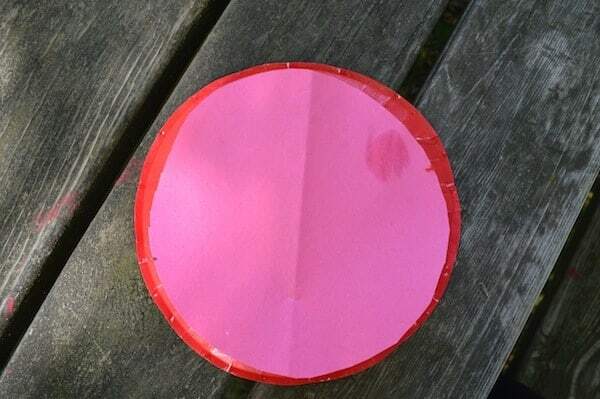 While it dries, trace the inside (where you would place food) of the second paper plate onto your piece of red construction paper. 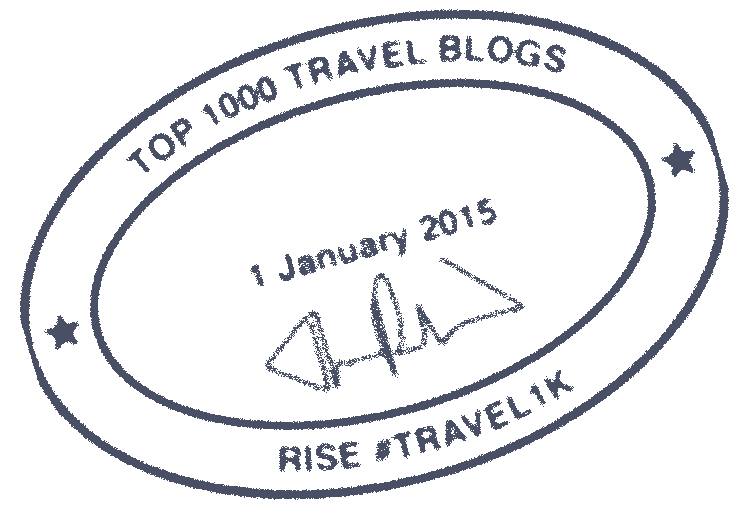 Once you have the circle cut out fold it in half and cut, forming two halves of the shell. Secure the two halves onto the red plate with the fasteners. 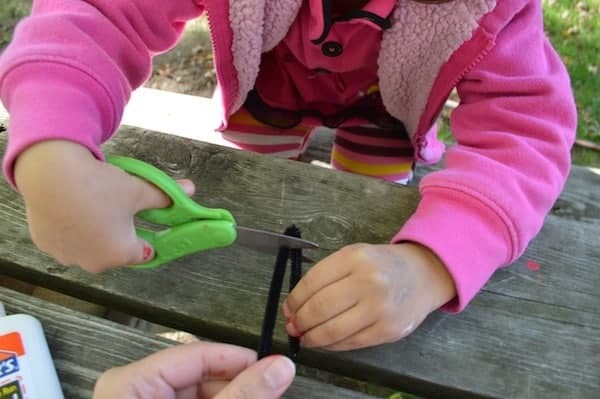 You may need to prepoke the holes with your scissors to get the fasteners through. 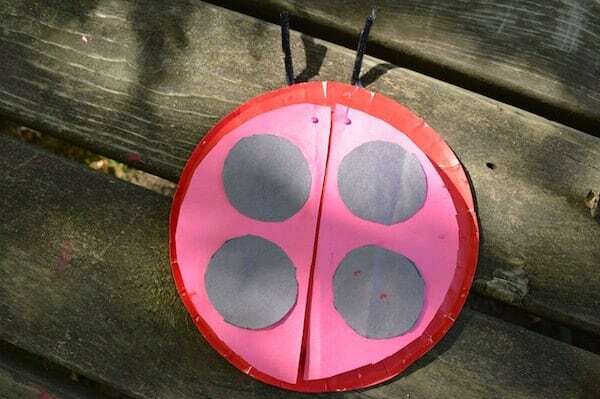 This will create the Elytra (commonly but incorrectly often called wings of a Ladybug). Once they’re fastened use your cylinder object to trace and cut out four circles from the black paper. Glue them to the ladybugs wings. Finally cut one of the pipe cleaners into the 3 equal portions. Repeat with the following pipe cleaners. You should have 9 pieces total. 6 for legs, 2 for antennae and 1 to discard. 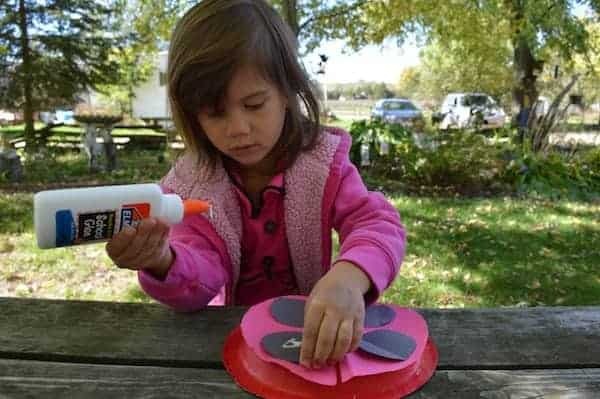 Apply the pipe cleaners to the underside of your paper plate using crafting glue. Finally, write fun facts about Ladybugs under the Elytra. Fun Fact: Nearly all Ladybugs (beetles) feed on aphids and other soft-bodied insects. This helps protect crops and plants so you can see why Gardeners love them! A very hungry, adult can devour 50 aphids per day. The Orkin Ecologist website inspired this project with all of it’s amazing educational resource for kids, adults, teachers, students and science lovers alike. I highly recommend it for any curious, future entomologist or if you’re looking for help on a future science project. What’s do you think about it’s resources? Ashley spends her days avoiding run-ons as she turns words from yellow to chartreuse and wearing out the M & N keys writing about Travel, DIY, and Tech. She hopes to inspire the masses to travel and LIVE happily one InstaTweetPin at a time. You could also put some small pics in there too. Got that idea from the ZINK hAppy printer! Very cool little gadget that plays well with other crafts, like this one! That is so cute! Had never thought to do something like this! That is too cute, I love how the facts are written behind the wings.